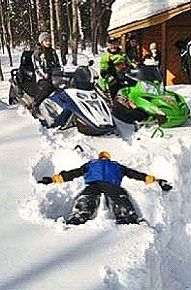 QUALITY is the word we use to describe the great snowmobiling trails in Lac du Flambeau Wisconsin. Thanks to all our hardworking snowmobile club members, the Northern Hornshoe Trails Club, our snowmobiling trails have been recognized as some of the best in the state of Wisconsin. We are known for our good will, friendliness, and our culture and history. 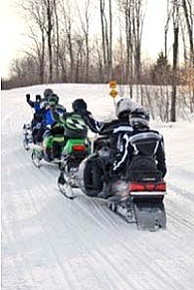 Lac du Flambeau Wisconsin is well known for scenic snowmobiling trail vistas and dense woods combine with the awesome vastness of the Powell Marsh Wildlife area and reserve that you cross, makes this one of the most enjoyable rides you will have all season. 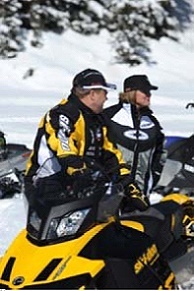 After a fun ride on the snowmobile trails visit one of our many restaurants, retail stores or casino. The Lac du Flambeau Wisconsin snowmobile trails are also centrally located so that staying here makes it possible for you to go south to the Minocqua, St. Germain and Eagle River areas, or go north to the “snow belt areas” of northern Vilas County, and on to the UP of Michigan. They are all a short ride away. We look forward to your visit to our beautiful area. PLEASE ride safe! (Thanks you and we’ll be seeing you!